Spotify has announced that Android users will now have access to the same unlimited free radio streaming that iOS users have been enjoying since June. The move is designed to further help Spotify compete with other streaming music services like Pandora, Songza and Slacker. The service for Android users is very similar to the experience that iOS users currently have but there are a few small differences. Members can now listen to unlimited radio based on input data like song name, artist or playlist. Users can rate songs with a thumbs up or thumbs down and add tracks they like to a playlist that will sync across all devices. Free members are subjected to about two to three minutes of commercials per hour and can only skip about six songs in the same time period. For $9.99 per month, users can eliminate all commercials and skip restrictions. But as The Verge points out, the real news here isn’t about Android users but the impact that this free feature had on iOS users. When Spotify launched the iOS radio feature last month, the app skyrocketed in the App Store charts, sitting at the number two spot for multiple days. It also topped the Music category for over two weeks. "We currently have over 30,000 reviews in the App Store for the current release of Spotify for iOS — the highest number of reviews we've ever had. 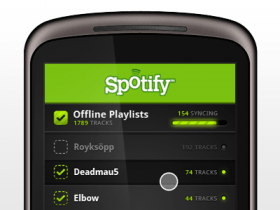 User reception has been overwhelming positive," said Spotify spokesperson Donovan Sung. The company’s app rating also improved after the launch on iOS, jumping from an average of four stars to an average of five. The only thing missing now in Spotify’s stable is an Android tablet app, which is probably coming in the not-too-distant future.